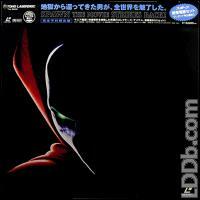 SPAWN:THE MOVIE,JAPANESE RELEASE CIRCA 1998.WIDESCREEN.3 DISCS ARE MINT.BOX/OBI/INSERTS/PHOTO BOOKLET.. ALL ARE MINT. INNER JACKETS 1 & 2 MINT. DISC 3 JACKET w/ BOTTOM SEAM TEAR. AWESOME SPECIMEN. PIC'S ???!!! Discs excellent. Cover excellent. Includes phone card and booklet. NO OBI, hence the 7 rank. No shelfwear on black shiny cover. Very nice except no OBI. Always ask for pictures.